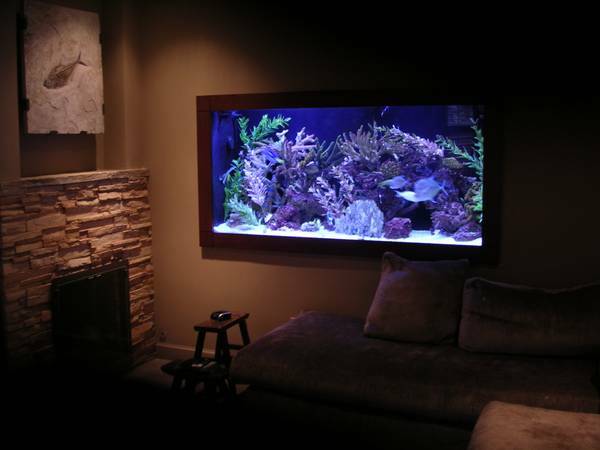 This is a custom in-wall design aquarium, picture frame front. The tank sits on a 2″ steel stand. This custom set up is designed with saltwater fish in mind and comes complete with all the necessary equipment. It has metal halide lighting sufficient to grow soft or large polyp stony corals. Wet Dry Filter comes complete with UV, Skimmer, New Clear Cartridge Filter and a 1/3hp chiller. The steel stand features an emergency drip collection tray as well. Everything is ready to move and be installed into your home or office. This is a top of the line aquarium! We offer full professional installation of this system into your home or office, and can service and maintain it for you as well. We design, install, and service aquariums and ponds in all the greater Los Angeles areas. We provide all supplies & livestock too! See more of what we do here…. Give us a call at 323-546-Tank if you are interested in this systemor are looking for a trustworthy and knowledgeable company to care for your aquarium.